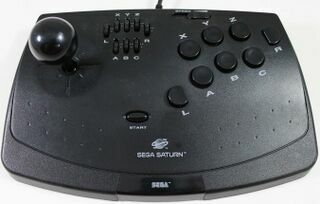 The Virtua Stick (バーチャスティック) is an arcade stick peripheral released for the Sega Saturn - the first officially licensed one built by Sega. There are two models of the Virtua Stick, the first (HSS-0104) was released internationally and features turbo switches, while the second (HSS-0136) only made it to Japan and is closer to what you might find built-in to Sega arcade cabinets. Both Virtua sticks have nine face buttons, seven functioning like the regular face buttons on a regular Saturn Controller and another two for and . As the name suggests, the Virtua Stick was intended to be used with Virtua Fighter, one of the earliest Saturn versus fighting games. The Virtua Stick was redesigned for the Japanese audience to make it more authentic. The buttons and joysticks were replaced those more common to the arcade. The second Virtua Stick would go on to influence the Dreamcast Arcade Stick in the years that followed, as well as PlayStation 2 and PC versions. The HSS-0136 model was also re-released for the Dreamcast by a third-party, including an internal Sega Saturn to Dreamcast controller adapter. It was re-branded as "DC GAMEMATE Fighting Stick" by sticking new foil labels over the old branding. Japan also received the Virtua Stick Pro, which adds space for a second player. Main article: Virtua Stick/Magazine articles.